Please join us Tuesday, October 28th, for a lecture and book signing with Christopher Cokinos, author of Hope is the thing with feathers: A personal chronicle of vanished birds. This event is free and open to the public. Additional details below. This event is free and open to the public but please RSVP to SILRSVP@si.edu or call 202-633-2241 if you plan to join us. Book signing with Christopher Cokinos will follow the lecture. Christopher Cokinos, the author of Hope Is the Thing with Feathers: A Personal Chronicle of Vanished Birds (Tarcher/Penguin), the classic natural history of six extinct North American birds, will share some remarkable stories about the passenger pigeon, the Carolina parakeet, the great auk, the Labrador duck, the ivory-billed woodpecker and the heath hen. There’s the tale of the biology professor (and part-time milk man) who tries to save the heath hens on Martha’s Vineyard…the graduate student who returns south in the 1940s to write the first book on the ivory-bill as its forest was being logged in order to make tea-crates for the British Army…the story of the boy who shot in 1900 what is still officially considered the last wild passenger pigeon. These stories tie us to the past and the future, the land and the sky–and raise profound questions about the role of environmental memory. This year is the centennial of the death of Martha, the last passenger pigeon on Earth. The extinction of her species–once the most abundant land bird on the planet–offers more than the usual lessons we draw from such losses. In fact, those usual lessons of “remember” and “never again” are failing us at a time of fast-moving environmental change. What was heresy 100 years ago may have saved the passenger pigeon. What are the heresies that may help us and the biosphere today? Can we find a balance between memory and heresy that allows us to pursue what Cokinos calls “re-civilization”? Christopher Cokinos is also the author of The Fallen Sky: An Intimate History of Shooting Stars (Tarcher/Penguin), Bodies, of the Holocene (Truman) and Held as Earth (Finishing Line). His work has appeared in such venues as The New York Times, The American Scholar, Orion, Poetry, Science and Western Humanities Review. He contributes to the Los Angeles Times and High Country News and is the winner of several national writing awards, including a Whiting and the Sigurd Olson prize. 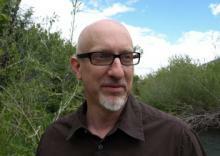 He’s at work on an anthology of contemporary Sonoran desert nature writing, among other projects, and is a Udall Fellow in Public Policy at the University of Arizona, where he is an Associate Professor of English and Affiliated Faculty with the Institute of the Environment. Next Post Spring 2015 Internships!